Because of the obvious differences between traditional print publishing and the digital kind — the lack of a physical product, the fact that one can link and the other can’t, differences in the speed of publishing, etc. — it’s easy to come to the conclusion that print is the problem. But in many ways, as Frederic Filloux argues in a post at The Monday Note, the biggest problem is the cultural differences between the two. 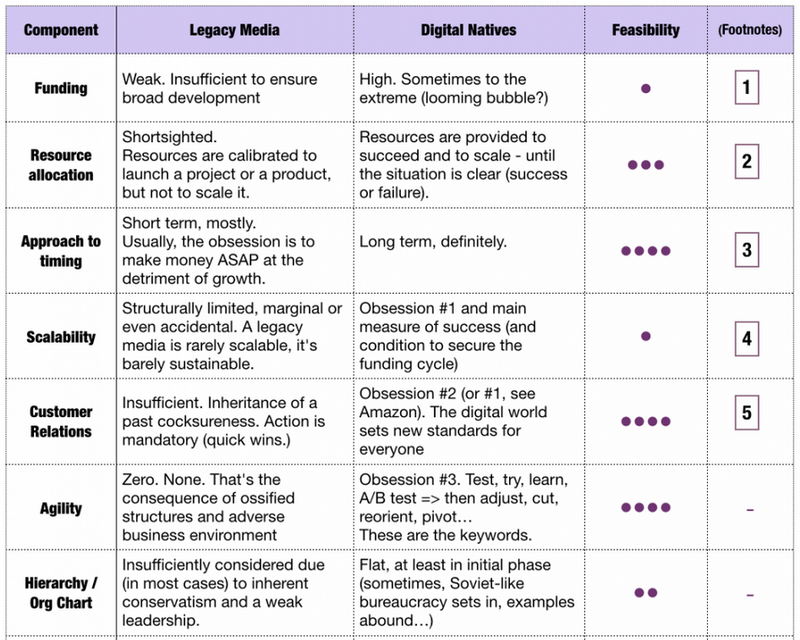 In his post, Filloux notes that more than fifteen years after the consumer web started to become mainstream and the disruption of media began in earnest, many traditional publishers are still struggling to grapple with the issues that disruption raises. Even the New York Times, with its massive resources, filled an entire “innovation report” with the things that it still needs to do. Filloux goes on to list what he describes as the most critical issues and “areas of transformation” for newspapers and other mainstream media outlets, a list that includes funding, resource allocation, scalability, timing and attitudes towards risk and failure. And what’s most interesting to me is what he doesn’t mention — namely, any mention of print vs. digital, or in fact any distribution method. Obviously, as the NYT innovation report described, there are issues that media companies need to resolve when it comes to the focus on print vs. digital — whether an organization is “digital first,” etc. — and there are also things that companies need to figure out when it comes to mobile, including thinking about content differently, text vs. images, video and so on. But I think Filloux is right that the main challenges are cultural, and that the reason why some new-media entities are succeeding or growing quickly has more to do with how they behave or think about what they are doing, rather than any magical properties of the digital platforms they use. As management guru Peter Drucker liked to say, culture eats strategy for breakfast. For me at least, the qualities that Filloux identifies that are the most important include a) agility, b) attitude toward risk and failure and c) what he calls “hierarchy” or the “org chart.” As he points out, many traditional media organizations would score close to zero on the agility scale, there is little or no incentive to try new things because of a lack of tolerance for failure, and the rigidity of management prevents any experimentation that does exist from succeeding or being replicated. To its credit, the New York Times innovation report talked a little about some of these challenges — including the tendency for different parts of the paper to function in “silos,” which prevented them from collaborating as much as they should, and an over-reliance on elaborate business plans. Also, to be fair, some of the things Filloux describes — the prevalence of short-term thinking, a failure to appreciate the need for scale when it comes to new projects, and so on — are related to the first problem he mentions: namely, a lack of funding. It may be easy for BuzzFeed and VICE to experiment and think long-term when they are getting $50 million or more in outside financing, but it’s harder to do when all your revenue numbers are headed south. Unfortunately for many of the traditional media players Filloux is talking about, changing the culture of an organization is orders of magnitude more difficult than designing a good website or mobile app, but it is arguably the most important item in the long list of things those companies need to do. There are a lot of different kinds of ‘print’. We focus on local community publications and we see many are embracing more contemporary ideas and concepts. The biggest challenge the industry seems to face are myths about how digital effects print from readership to revenue. As there continues to be more success stories the fear that media is black and white (print or digital) is starting to subside and clear strategies are starting to emerge that publishers can emulate in their business removing the need for the digital-embracing-publisher to be a trailblazer.